Thx for the comments guys! Yeah I'm loving the orange, it did come out darker than initially intended but I think that fits the "Autumn" aspect of this army better. Welsh eh? I never thought about that before, to be honest I think I like the dialect (is that the right descriptor in this case?) of it better, it does seem more Eldar-ish than Japanese. I'm running late to get to my game (got a 200 km drive to get there) so I wont be able to finalize the name right now but when I get back I'll do some research in to bastardizing welsh too Thx for the suggestion Finnan. I'll take some pics of this force on the tabletop at the game and hopefully they wont be as poor quality as my pics last night... I blame 2AM and my cell phone, I really should invest in a proper camera and a photo booth thingy. Well had my first battle with the army yesterday and even though I lost by one VP I still feel pretty good. In short my opponent only won because he had a 20-man CSM squad with a lord hunkered in mid map in ruins. His warlord trait (from crimson slaughter) gave him and that squad shrouded. So CSM in mid-field with 2++, yeah no amount of firepower was moving them for me. He took out one squad of rangers giving him first blood. By turn 5 I had two options A) Assault him with my bikes and hope for a miracle or B) Use bikes to get linebreaker and hide the rest of my units and wait for the game to end to get a tie. Since turtling like a coward waiting for the end of the game sounds boring I opted for the kamikaze charge just for giggles and it went about as well as you'd expect. I'll be honest his strategy made perfect sense and it was very effective (defensibly speaking, he only killed 7 rangers all game) but it was boring to fight against. Oh well it gave me a good chance to learn how to play my force without having to really counter-strategize. Anyways here's a pic I took after the battle of my force in some nice painted terrain. The war walkers have been ordered and are on their way right now, I'm stoked to keep this project going. So here some shots, I'll try to post more tomorrow that should be where I'm at just prior to sitting down to paint. Thanks as always for checking out the project. Cool, kudos on the house! Be sure to claim you man-cave beforehand. And make it one with a window, and install a couch+telly so the missus can join in the background whilst painting. And good job on the factory assembly line, those ELdar keep turning out great. Don't worry Meph the house is being utilized very well I'm now the proud owner of two houses, my old house being used as rental property to generate me some extra income. For this house I have a huge open concept basement that I can easily fit 3 or 4 gaming tables in comfortably so I can start hosting our 40k nights here. We don't have any FLGS here (the closest is 2 hours away) so we're all basement commanders. The plan is to put up a projector downstairs for movies and save the 60" flatscreen upstairs for vidji gaming. I got a workshop in the basement too (it's a fair size with work bench and cupboards and a vice) that will be my more permanent setup for painting in the future. Sadly my girlfriend won't be joining me in the house for a while. She is living in the city 2 hours away currently. She moved there to pursue her tattooing apprenticeship. She should be moving back in about 2 years I think. Visiting her does give me a good excuse to drop by GW once in a while though to play a game or pickup the next models I need so it's not all bad. Once I'm off work today I'll post more pics, I got some updates on the soul gems I spattered all over the war walkers. Oh and a first time project of mine with my vypers, I'm stoked to post that update too. Ok update time! Just a small one for now to show off the war walker progress. Hope you guys like it! Also after much deliberation I think I may have settled on a name, lemme know what you guys think. Here's the breakdown. I took Finnan's advice and used a welsh translation of Autumn Ghosts which turned out to be Ysbridion Hydref. Chopped it up, re-arranged it and voila. So does it fit and seem Eldar themed enough? if you looked at a list of armies signed up for a tourney would you think just by the name alone that this name could belong to an Eldar force? Also is it stupid? Would you re-arrange the two welsh words in another way? Alright got a fair amount of pics to post here for my finally completed war walkers and the special project I worked on.Starts off with the work I did on the war walkers then to my first forays into magnetization! It was quite the learning experience but in the end I believe it was completely worthwhile, now I will be painting up all the different weapon options and magnetizing them as well so that I can have a very versatile force. Hope you guys enjoy and comments and critiques are welcome. Subject: Re:Inevitable_Faith's Eldar project log-750 points Done! Moving to 1000! I've also managed to carve out a section of my new home and transform it into my fortress of soli... bomb shelt... panic ro... place I do painting and modelling in! It's not finished, got a paint-pot rack to build, got the parts ready to assemble for a fan exhaust system for my priming box, would like to build a photo box aswell. But for now she fits the role well enough and I have been hard at work making this a force to be reckoned with! I did go back and re-work my war walkers too, I wasn't quite happy how they turned out so I re-painted some sections to add more visual variety without compromising the feel of the army and hopefully lead the eye around the model more. I've also begun work on my most ambitious unit to date, I'll be updating with pics of them in in the very near future and hopefully you guys can let me know if the new unit is solid looking or a waste of time. So without further ramblings I present to you the first update in a long while and most certainly not the last. Please let me know what you guys think so far, your words of wisdom, encouragement, critique and admonishment keep me motivated, focused and give me great advice on how to move forward with the force! Subject: Inevitable_Faith's Eldar project log-1250 points Complete! I'm a bit envious. I've not had a good painting are in nearly 2 years. One of the most underrated things about the hobby. I like how your army has turned out so far. Very nice looking color scheme and execution. It has a decent variety of shooting and extremely mobile. You just need a Wraithknight now to get you to 1500 points. Thanks for posting. It's an enjoyable Eldar blog. I completely agree, having somewhere dedicated to the hobby where all my stuff is either setup already or very accessible has made a world of difference. I'm glad to be in a house that grants me the space (as un-glamorous as it is) to have this. Thank you very much for checkin out the log, I appreciate you taking the time to comment. The idea has always been to be either fast or sneaky (skimmers or infiltrate/scouts) and so far the army fits that design, I'm happy to say it even performs very well for me on the tabletop. I won't be purchasing a wraithknight for this force as I don't feel it exemplifies the theme (as much as I'm dying to assemble and paint that gorgeous model!) but I do plan to purchase 1 or two wraithknights for a future wraith army I'd like to build, I've been working on lists involving plenty of guards/blades assisted by knights, lords, hemlock wraithfighters and of course seers. That's a future project though for after this one is complete and I take some time to work on my CSM forces. I'm currently working on the next 250 points that'll bring me to 1500 and have 4 of the 10 models built, I'll be posting update pics on those tomorrow. Thanks again for commenting, I really appreciate it. Subject: Re:Inevitable_Faith's Eldar project log-1250 points Complete! Quick update tonight with my latest additions to the army... Striking Scorpions! Or I guess counts-as striking scorpions to say the least. This is my second foray into kitbashing and my first time ever using GS! The Farseer doesn't really counts cause I had a lot of help with him lol. So I wanted to stick to my theme and infantry that didn't mix well with my rangers just wouldn't cut it, so I had to come up with a new idea. I have nothing against the GW Striking scorpions, I think they are quite cool, however they just didn't fit the style of my army. The idea behind these guys is that they sneak and get into positions much like the rangers do, the main difference being the role they play. I wanted to represent how they function with the models themselves so there was no question as to the unit they count as. To that effect I am giving 9 of them chainswords, an obvious choice given their basis. They also have the mandatory shuriken pistols but with one small change, since I converted these pistols using shuriken catapults they have the full-size catapult magazines. My reasoning for this is that since I couldn't think of a good way to represent the mandiblasters I needed something else to show they have the extra attacks in CC. So my lore for this is they use high-cap mag shuriken pistols set with a burst-fire mode for in tight combat. In melee they use the burst fire from their pistols to essentially get extra attacks in CC just as the mandiblasters would normally give them. Watcha guys think of that, too cheesy perhaps? Not clear enough or noticeable? Any other ideas for representing Mandiblasters? I only have four made so far as tests but I am really at a loss for making my exarch and especially his scorpions claw, any ideas on how to build a counts-as scorp claw? As always thanks for reading and please let me know what you think. Subject: Re:Inevitable_Faith's Eldar project log- Striking Scorpions Inbound! Just a small update with my army in action since I got to have a match this afternoon against a tyranid buddy. It was a very decisive victory for the Eldar, his MC couldn't stand up to my plethora of shuriken cannons, star cannons and bright lances. The termagaunts died in droves to my jetbikes and eldritch storm from my farseer. he did make it into CC at turn 4 though but it was too little too late. We had a great match though and had tons of fun. Subject: Inevitable_Faith's Eldar project log- Striking Scorpions Inbound! Your eldar are carrying rather brutal looking chainswords. Nice conversions. Nice conversions. The chainswords look much more menacing than the normal Pansy, I mean Eldar ones. The SMG style pistols look real nice too. My thumbs they go up. Yeah unfortunately I couldn't find any easily accessible smaller chain swords. The storm guardians kit on the GW site is like 22$ and only has 4 chain swords, 4 regular swords and a couple special weapons, flamer and fusion gun I think. Needless to say I'd have needed 3 packs to suit my needs and that was 66$ just for chainswords, not something I could afford. On the other hand CSM chain swords is something I have in spades. I know they look kinda big on them but I figure that can help represent the +1 strength they receive with them. Thanks for commenting guys, I'm glad my first true conversions weren't met with confusion and disappointment. If anyone has any ideas for making a scorpion claw please let me know, I've been diving through my bits box and so far no inspiration has hit me. Might I suggest looking into daemonettes. Huge assortment of claws on similar sized bodies, or look into the dark eldar line. Dark elves might have something as well. A little bit of greenstuff and you could make it work. without the pieces in my hand to draw inspiration it's hard to say. Subject: Re:Inevitable_Faith's Eldar project log- I made a gaming board! Well this isn't exactly an Eldar update but I'm excited for it nonetheless, I finally got around to making a gaming board! My criteria for what I wanted was something that is easy to transport, durable, simple to use and set up and affordable. The cost of materials was 30$, I was thrilled with that. Started with 2 4x4 sheets of 1/2" osb and cut 6" off each one. Sadly the only hinges I was able to get that would work were not the style I wanted but beggars can't be choosers right? I toyed around with having the hinges on the bottom but then when I rest the board down it would bulge in the middle. Having played on it now the hinges don't get in the way nearly as much as I feared they would so it'll do. The handles were an on-the-fly decision to aid in transport since I knew I had 6" on either side to play with and I felt it would aid in moving it around, I'm glad I cut them as when it folds up they line up nicely and make moving the board very convenient. I have a small car and with this board folded up it fits just perfectly in the back with a couple inches to spare so it doesn't shift around too much at all. After 5 cans of textured spray paint spread over 3 coats I finally got it covered nicely and just popped some sealer on there to protect it from chipping or losing texture. I'm thinking of adding some snow flocking to add some variety to the board and make it a bit more visually appealing, any ideas on how to do that well? Total board size is 4x7 so I have 6 inches on either side to put models that have been killed or are in reserve. I only have it lined out right now but I'm planning on either painting yellow caution striping on it or doing little cute parking stalls with yellow paint and even a little handicap parking stall reserved for Tau Whatcha think guys? Parking stalls or caution striping? I can get some yellow road paint we used at work to mark out real parking stalls so that bit will be free. That's enough blather from me, here's the pics and lemme know what you think! Subject: Inevitable_Faith's Eldar project log- I made a gaming board! I vote parking stalls. Caution stripes are overdone. Subject: Re:Inevitable_Faith's Eldar project log- Striking Scorpions conversions Built! Alright folks I finally finished my very first major conversion project! I'm super stoked on how these turned out overall. I know there is tons of room for improvement, there always is, but since this is my first true kit-bash and use of GS I'm happy with the results. I have to work a lot harder on trying to smooth out the GS where I can, I think that will come with more practice, I already noticed some discrepancies between my initial batch of GS scorpions vs. the later batch I did. As for the Exarch, I'd like to thank Tastymuffintop for his suggestion to use DE parts to make one, I used a wych CCW that resembled a claw (more of a punching dagger I guess eh?) and I think it looks pretty good. It doesn't explain the x2 strength very well so my reasoning is that it's such a precise weapon used with such skill and grace that it finds the holes and chinks in an opponents armour and is driven where it will cause the most harm, hence the AP2 and double str. Ok I'm gunna shut up now and let the pics speak for themselves. Please let me know what you guys think. Your comments, critiques and verbal abuse keep me motivated! Thanks you. And the exarch! What you think, look deadly enough to be the exarchs of lore? Well it's been quite a while since I've updated this, I wish I had more to show for it but unfortunately with the firefighter competitions going on right now, training leading up to said competitions, beautiful weather, vacation, catching up on my xbox game backlog... blah blah blah excuses. Anyways painting is slowly progressing on the striking scorpions, I have the armour mostly done short of a few details. The cloaks are based, just need highlighting. The plan is to paint the guns and swords in the bone colours I've been making all of my weapons to date. My concern is for the teeth on the chain swords, should I make them bone as well or perhaps silver, maybe do bronze teeth? Any ideas ladies and gentlemen, right now I'm on the fence about it so any input would be greatly appreciated. The pics here are at a couple stages, one is based, then layered and highlighted pre-wash then the final post-wash pics. I wanted to show the pre and post-wash pics cause I find the difference it makes is astounding. Hopefully the pics can do the change justice. Without any more pre-amble here's some process steps of doing the orange armour. Ok I lied, more pre-amble: After looking at the pics I found the colours, especially after the wash, look really drowned out. I swear that is not the case, I blame my poor photography. The closeup of the post-wash makes the model looks like it's hyper-highlighted (wow direct sunlight makes a huge difference over a lamp or room-lighting), which is not the case either. I really need to get myself a lightbox and learn the take proper photos... sorry guys. Subject: Re:Inevitable_Faith's Eldar project log- 1500 points complete! Well it's been a long time since my last update. With summer in full swing the painting has taken a back seat. Took me way longer to finish these guys up than anticipated but I finally got them to a point where I can field them happily. I'll likely go back and do touch-ups on them later to pick out more details but for now they are painted. As with everything in the army I will hold off on basing them until I have all 2000 points ready as I'd like to just mix one tub of the rubble and apply it army-wide. Let me know what you think of my first major conversions, it was quite the learning experience and I'd appreciate the input/critique. Been a long time since I've posted here. I have a few projects still under way but I had to move the Eldar force to the sidelines to make space for real life stuff. Here's something I had a lot of fun with though: Grey knights. Or more specifically a single little knight. So I now happily present to you: Sir Terrynce Von Mannfredd the 3rd! Please enjoy and let me know what you all think. I've also added a shot of him in his "natural environs" valiantly standing vigil over my front yard. 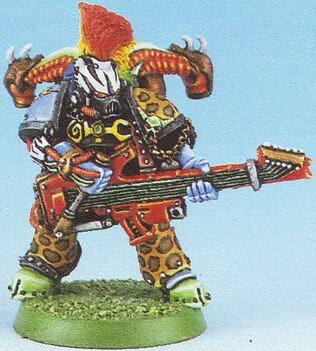 Yeah a buddy of mine reminded me that leopard print is far from original, emperor's children did it first. When I returned this model to my friend he was pretty shocked but said he liked it a lot. I offered to paint his whole army in this scheme for him but he refused. Subject: Re:Inevitable_Faith's Project Log, The road to Armies on Parade! So I decided to sign up for this years Armies on Parade at a GW location 200km away from me. A friend of mine who plays Necron and myself will be going and seeing if our forces can hold a candle to some of the talent out east. Since we are so far away from them we've never seen what talent were up against so hopefully my adequate painting and small conversions can not get too embarrassed. With that said we've been hard at work getting our 2x2 boards ready. We asked if we could be displayed side by side and the staff at GW said yes, with that confirmed we opted to do matching boards so it looks like our forces are facing off against each other. Working with what we got we opted to make the standoff in a ruined imperial city. I bought the sector imperialis box set over a year ago so I figured I'd finally get the pieces painted for this event. Below are some shots of the buildings I've done up, all drybrushed save for the splotches of seraphim sepia I used to dirty up the walkways. I've also finally based my models! The rangers and Striking scorpions are done now and while I didn't follow through with my initial basing plan I feel they still came out looking pretty good all the same. As I progress on the table I'll add some shots of it that should give you all an idea of the plan there. In the meantime let me know what you think of the buildings and basing thus far. I look forward to hearing what you all have to say. Subject: Inevitable_Faith's Project Log, The road to Armies on Parade! Thank you very much for the comment! I look forward to continuing my work on basing more of them this evening. War walkers are next up on my list. The table should also be mostly complete by this evening too if all goes to plan. I'll be posting pics of those later tonight or tomorrow afternoon at the latest. My friend is indeed going to keep his Grey knight as it is. We had a chat recently and apparently it's really grown on him lol. I look forward to seeing what he does with the rest of the force cause I have a feeling that Mannfredd will be quite the standout character in almost any paint scheme he's likely to give them. Work continued this evening and progress was made. Firstly I have the basing started on my war walkers, I'll be painting that tomorrow, shouldn't take too long I figure. Secondly is the "flames" for my table. I have some flickering light tea candles that I made inserts into the table for. The plan is to have these lights in those inserts and flickering light up into some rubble piles I've made and in the windows of one of the buildings. The circular cutouts are dryer softener sheets that I lightly sprayed with my black primer. They'll go over the lights to diffuse them. This serves two purposes: One is to diffuse the light and make it less harsh when it lights up the terrain and secondly the cutouts help to mask the lights on the table. Even if I don't have the nicest table at the event I should at least have the nicest SMELLING table! A table that smells of lavender should be worth points to voters right? Lastly is a shot of the name-plates I made up for both mine and my friends table. Nothings special but it helps to harmonize the concept. I'm sure you can tell which one is for my Eldar table and which one is for his Necron table lol. Lemme know what you guys thinks so far, especially on the lights idea, I hope to have some action shots tomorrow to show you guys my vision for these lights and maybe they'll make more sense. Ok so not a huge update tonight unfortunately other than that my table for armies on parade is now done. It's been a long road, learning a LOT along the way. It's a whole new set of skills to make a table as opposed to building and painting models. At times I felt I was 6 years old again doing arts and crafts at school. Other times... well other times I wanted to flip the very table (as small as it is) that I was trying to make. So tonight all I have is the pics of the final two tables for myself and my friend. Overall I am not really happy with them, the drybrushing technique I used didn't work at all and left everything all streaky. I'm out of time to try and fix it up now so I'm stuck with them and I can only hope that my buildings and army stand out enough to distract from the flawed tables. Tomorrow I'll insert the candles with the last bits of rubble and see how the lighting is gunna look, of course I'll post pics of that too so everyone can see the last shot of it before the big day. On a bright note I feel my bases for my war walkers look amazing. I have no shots of them yet though cause the wash is drying and it's not representative of the final results, I'll post that tomorrow. Here's the shots of the two tables without any extra terrain on them, hopefully they dress up nicely. The photos I attach here are the first time the elements of the board have been all put together, taking these photos was the first time I had seen the board at this stage myself, I won't see the board completed until tomorrow while it is on display. I also have the bases for my war walkers posted here too, the pics made the contrast on them look deeper than they are in person. I'm very happy with them and feel they turned out great. Wrapping this up now it's just past midnight and I must sleep, I have a two and a half hour drive to get the GW tomorrow for setup. I hope for the best (I have no idea why I want to win a medal so bad, they are gorgeous medals, but I'm not normally a competitive person) but I'm sure I'll have a fun day seeing other hobbyists work and meeting new people. Of course I'll take photos of the event as well and post here so anyone interested may see the final results.